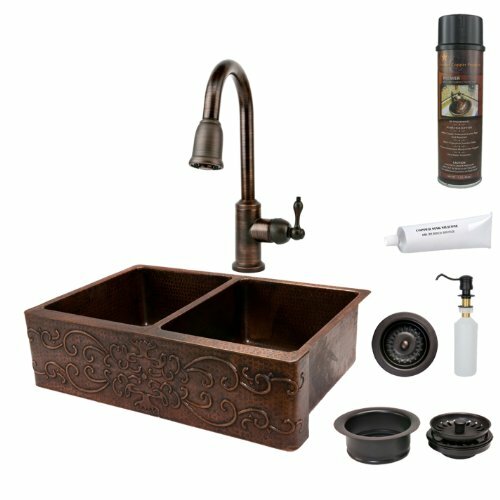 Package includes : Copper Hammered Kitchen Apron 50/50 Double Basin Sink with Scroll Design, Oil Rubbed Bronze, 33-Inch. Single Handle Kitchen Faucet with Pullout Spray, Oil Rubbed Bronze. Solid Brass Soap or Lotion Dispenser, Oil Rubbed Bronze. 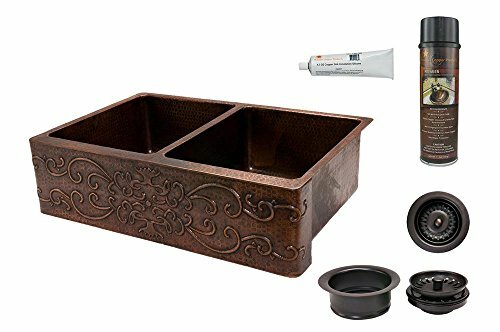 Deluxe Garbage Disposal Drain with Basket, Oil Rubbed Bronze, 3. 5-Inch. 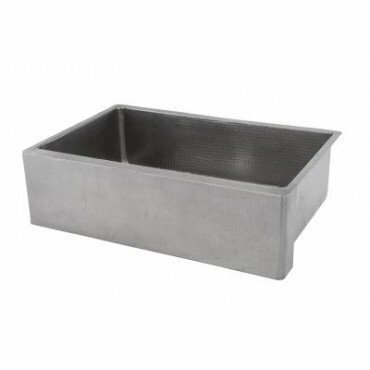 Kitchen Prep Bar Basket Strainer Drain, Oil Rubbed Bronze, 3. 5-Inch. Copper Sink Wax Cleaner. Installation Silicone. Scroll Apron Front 50/50 Basin Split. 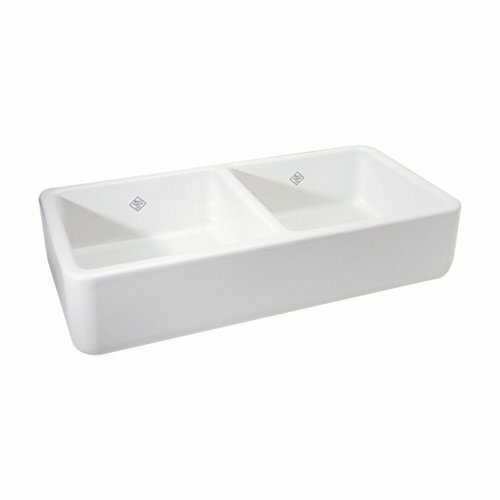 Dimensions : inner left basin 15-Inch by 19-Inch by 9-Inch, right basin 15-Inch by 19-Inch by 9-Inch, outer 33-Inch by 22-Inch by 9-Inch, apron depth 9-Inch. Countertop Depth Required : 25-Inch front to back. Material gauge : Industry Best (14-guage or . 0625-Inch). Drain Size : 3. 5-Inch. The faucet mounting position is counter deck mount. 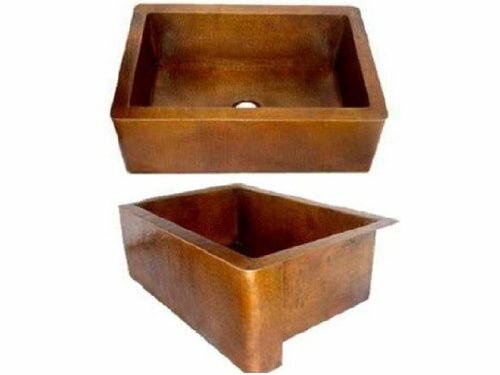 Sink is handmade, 100-Percent recyclable and made of 99. 7-Percent pure recycled copper. It is also lead free. Faucet features drip free ceramic disc cartridges, a retractable hose spout that extends up to 8. 44-Inch and dual spray options (stream or spray). Faucet dimensions : overall height : 16. 69-Inch, overall width : 12. 44-Inch, spout height : 9. 25-Inch, spout reach : 8. 44-Inch, spout swivel : 360-Degree. Maximum deck thickness : 2. 25-Inch. Mounting shank length : 2. 5-Inch. Mounting shank diameter : 1. 25-Inch. 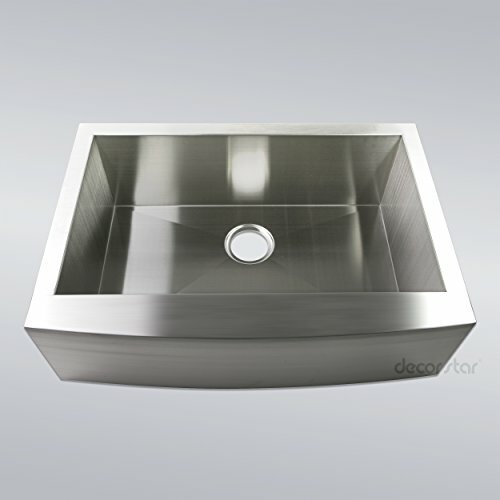 Disposal Drain with Strainer Basket has the following dimensions : inner 3. 5-Inch, outer 4. 25-Inch. Drain Size : 3. 5-Inch. 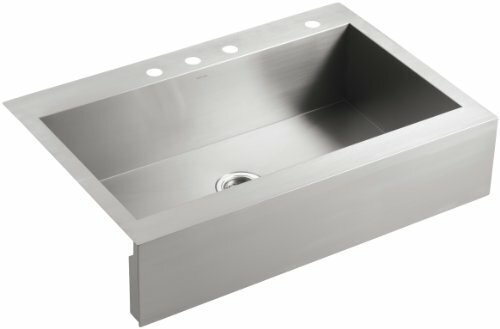 Disposal drain is In-Sink-Erator Brand compatible. The Soap or Lotion Dispenser’s top comes off for an easy above counter refill. Dispenser dimensions : above counter height : 3-Inch, overall height : 12-Inch, spout reach : 4-Inch, thread length : 2-3/8-Inch. Can be used with thin or thick countertops. Maximum deck thickness : 2-1/8-Inch. The wax cleaner is made from natural Bee’s wax. No wax build up ever. 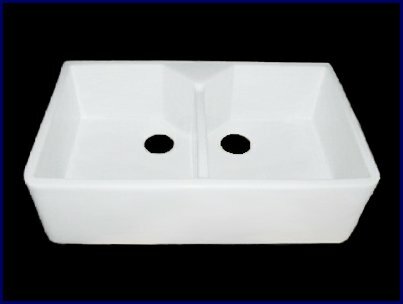 Wax cleans copper sinks, tubs, accessories, marble, granite, countertops, cabinets, wrought iron, faucets, glass, chrome, appliances, leather and more.